Day 6: Keith has finished school and joined us as a guest racer. Really it's not fair for me to have all the fun! We stayed with friends Dwayne and Renee and I took advantage of a King size bed getting some needed sleep. 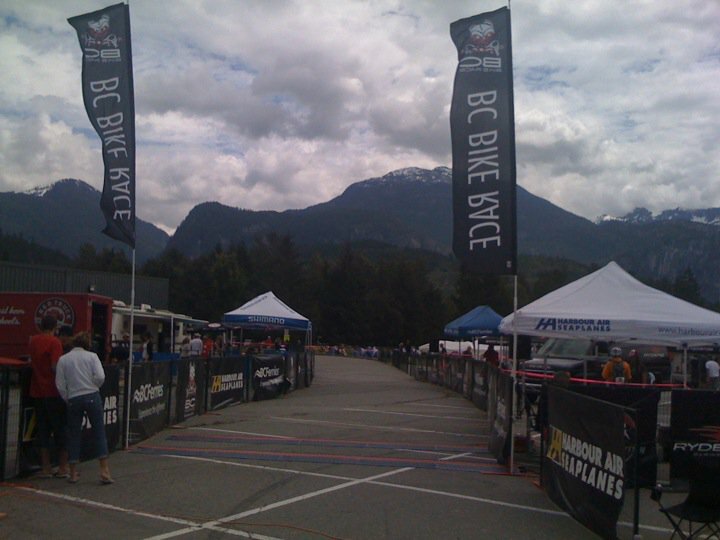 The Squamish stage incorporates the infamous test of Metal and gear Jammer courses offering riders tons of good descending. Some descents are more like jump trails where as others are rugged tests of agility and skill. I liked it all. After Yesterday's wicked day Geoff and I were amped to have another chick show down. We marked the top ten, but climbed within ourselves (by this I mean within my limits). We were riding in a large group containing the 2nd and 3rd place men's team and all the solo guys from 6th to 9th place. We strung together some good descents. On the climbs some guys tried to get away, but we kept them in check. The legs are definitely feeling yesterday's race, but still feel good. The intense racing up front early on is taking it's toll on the immunity of some of the guys with colds starting to appear. Geoff an I have raced smart and really came into our legs on the singletrack these last two days. That afternoon I got to hang out with the Shimano R&D guys and learn more about the new xtr as well as give them feedback. It has been phenomenal. The brakes are fantastic, they've done lots to prevent overheating, even with small rotors on the rear wheel. The shifting is smooth and dependable in all conditions and it feels and looks sharp. I also entered my second race of the day. The kids race with categories from 2 year run bikes to 7 year old hammer heads. I got worked over and Amanda had to give me mid race leg rubs to keep me going. Geoff Played 18 holes of Golf with some very respectable shots.